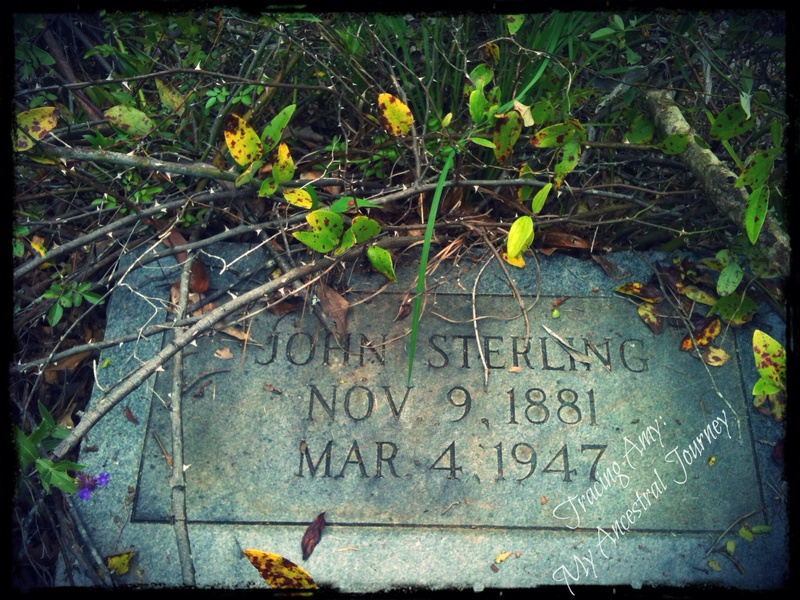 John “Johnny” STERLING was born on November 9, 1881,1 first born to George & Dorcas STERLING in Clarke County, Mississippi in what was known as the Maxville community.2 He was born just 18 years after the emancipation proclamation and 16 years after the abolishment of slavery. He is my maternal great grandfather and is also the ancestor that started me on this journey. I didn’t even know his name until my mother called me and intrigued me with the story about his parents that she had recently heard. She knew her grandfather’s name and had his picture stored away in a box, but she knew very little about him and nothing of his parents. He died before she was born so, all she had were stories of him being a mean man. She wanted to know more about him and his parents. She specifically wanted to know where and when he died and then where he was buried. She also wanted to know if the story of his parents were true (that’s another post). So, she called me up and put me to work. I haven’t stopped researching since. According to his WWI Draft Registration card, Grandpa Johnny was tall in stature with a strong build.4 In 1915, at the age of 33, he set out on his own and married Bessie STOKES (1895 – 1964) on January 4th.5 Bessie was the daughter of Henry and Malissa STOKES.6 The date they married stood out to me immediately, because its my birthday! John and Bessie STERLING had 7 children: Lillie (1915 – 2006), Lucille (1916 – 2000), Maudie (1919 – 1990), John (1920 – 2003), Thomas (1922 – 1988), George (1927- 2010), and Orvelle. When viewing the census records, I found that, with only a 6th grade education,7 he continued the family occupation of farming as started by his grandfather, Claiborne STERLING. I did find land records where he was given land by his grandfather,8 but I also found that he was later able to purchase additional lands on his own.9 It was on this land that he lived and farmed. After 25 years of marriage, Grandpa Johnny and Grandma Bessie decided to divorce in October 1940.10 Neither remarried. I know there is much more to learn about Grandpa Johnny in records that my eyes have not yet had the opportunity to see. I must admit that when I first saw the picture of Grandpa Johnny, I thought his eyes were a bit eerie. But I know the story behind those eyes now and as I began to research, that story and those eyes intrigued me (now I have even noticed that my mother’s eye are shaped the same as his). So, my search doesn’t stop here. I search until I am able to corroborate the family lore about those eyes that stare back at me. This is my first post as a part of the 52 Ancestors in 52 Weeks challenge, created by Amy Johnson Crow of No Story Too Small. 1. United States World War I Draft Registration Cards, 1917 – 1918, digital images. Ancestry.com (https://www.ancestry.com: accessed 16 February 2014), card for John Sterling, serial no. 1773, Registration Clarke County, Mississippi; Imaged from Family History Library microfilm. 2. 1900 U.S. census, Clarke County, Mississippi, population schedule, Maxville, p. 14, dwelling 117, family 117, George, Dan, and John Stirling; digital image, Ancestry.com (http://www.ancestry.com: 2012); citing Family History Library microfilm: 1240804. 3. 1900 U.S. census, Clarke Co., Mississippi, pop.sch., p.14, dwell. 117, fam. 117, George, Dan, and John Stirling. 4. United States World War I Draft Registration Cards, 1917 – 1918, images, Ancestry.com, card for John Sterling, serial no. 1773, Registration Clarke County, MS.
5. Clarke County, Mississippi, “Freedmen Marriage Record, Colored; v3 1914 – 1919”, page 39 for John Sterling and Bessie Stokes, Office of the Clerk of Circuit Court, Quitman. 6. Mississippi State Department of Health, death certificate 13450 (1962), Bessie B. Stokes; Vital Records, Jackson. 7. 1940 U.S. census, Clarke County, Mississippi, population schedule, Maxville, p.30, dwelling 275, family 275, John Sterling; digital image, Ancestry.com (http://www.ancestry.com: accessed 17 February 2014); citing National Archives and Records Administration, 1940; Roll T627_2015. 8. Clarke County, Mississippi, Deed Book N-1:535, Claborn Sterling to John Sterling, 26 April 1922; Office of the Clerk of Chancery Court, Quitman. 9. Clarke County, Mississippi, Claborn Sterling to John Sterling, 21 August 1926; Office of the Clerk of Chancery Court, Quitman. 10. Clarke County, Mississippi, Chancery Court, divorce file 3950 (1940), John Sterling v. Bessie B Stokes Sterling, final decree; Office of the Clerk of Chancery Court, Quitman. 11. Mississippi State Department of Health, death certificate 4696 (1947), John O. Sterling; Vital Records, Jackson. 12. Calvary Hill Baptist Church Cemetery (Clarke County, Mississippi; County Road 622), John Sterling marker, photograph taken by Amy L Cole, September 2012. 13. Historic Clarke County Mississippi. Second Edition. (Clarke County, Mississippi: Historic Clarke County, Inc, n.d.), 46. 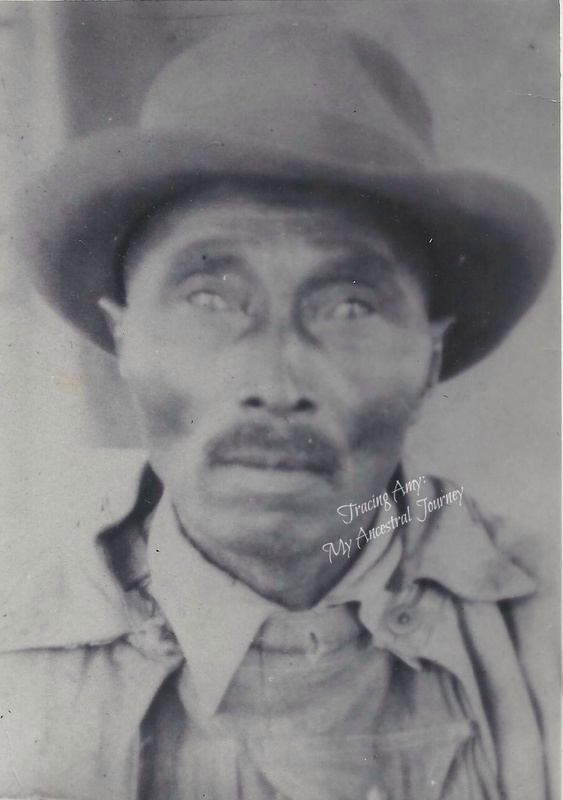 Amy L Cole, “52 Ancestors #1: John “Johnny” STERLING,” Tracing Amy: My Ancestral Journey, 22 February 2014 (https://tracingamy.wordpress.com: [access date]). This entry was posted in 52 Ancestors Challenge, Sterling and tagged 52 Ancerstors Challenge, 52ancestors, African-American Genealogy, African-American Research, Clarke County Mississippi, Genealogy, John STERLING. Bookmark the permalink. Great post! 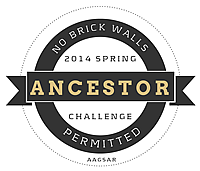 I think I am going to start the challenge of 52 Ancestors. Love the picture of Johnny. Thanks Iva! The challenge really has me thinking about what I really know about each anscestor. I have gathered records of some sort for all of them, but I don’t think I have really studied what I have. Most of that is because I have been focused on one particular line lately. But I think this will help me process what I have and what I still need to find. Although he was thought to be a mean man, his face looks kind. Thank you! Once I got past the eyes, I was able to really pay attention to the whole image and he doesn’t look mean at all. Great post Amy … you’re off to a very good start!! I agree with Linda, “his face looks kind”. Waiting for the next one. Thank you! Those features and eyes are whats next on the research list for this line. I thought Johnny’s eyes to be very striking, not eerie. =) I like the idea of providing a source citation for your own blog posts, too. Yes they are striking, although it took me a little while to get used to them. Providing the source citations was really a challenge for myself and it wasn’t as hard as i thought it would be. Hopefully they are useful to someone else in the future as well! Thanks for stopping by!! I debated about providing the source citations in my blog posts with my first post for 52 Ancestors. Part of what I am working on is properly citing my sources as I go back through information gathered from 1993-2003. I decided not to provide them in my posts as a sort of “bait” for possibly cousin connections to be motivated to contact me. =) What I really liked was providing the citation to your own post. I was thinking of borrowing that idea if I may? Yes! Definitely! It has really helped me to understand how to cite different sources. Well done. You are definitely uncovering some family treasures. I’m glad to know more about our Grandfather. You are doing a great job! Thanks Sister! I think there is still more to learn, but its hard to uncover everything without going home. It will all come in time though. This is great, Amy! I was led here by your new series “My Black History.” Do you think that John’s mother’s name was “Darc” in the census, short for “Dorcas”? And the poor woman lost 4 children by the time she was 38. Hi Elizabeth! Thank you for visiting! Yes, Dorcas was indeed his mother. I’ll have a post for her soon! Yes, and there is still one of her children that made it to adulthood that I can’t find past a certain period. I need to capture that issue in a post later. But this line of my family is quite interesting.